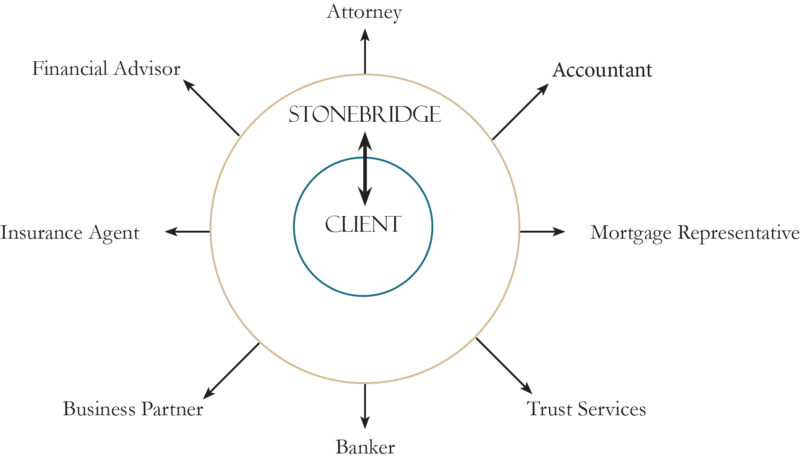 Accumulation, growth, protection, retirement, transfer, each step along the way Stonebridge serves as your trusted advisor to accomplish your goals. Our approach to wealth management and investment management starts with you and determining the right strategy. During this process, we take the time to understand your financial, professional and personal position and then work with you to create goals and objectives to develop a personalized strategy. We know that each client’s financial plan is specific to them and we work to design solutions that are unique to you. Once the strategy has been determined we work with your team of financial professionals to execute on the goals and objectives. At Stonebridge, we like to think of ourselves as the conductor of your orchestra. Your goals, objectives and strategy represent the musical score. The team of financial professionals you work with represents the musicians in the orchestra. As the conductor, it is our responsibility to coordinate those professionals to make sure they effectively execute on their part of the collective score. Like a conductor, it is also our responsibility to communicate any changes that may take place and make sure you are informed of any adjustments recommended by your team of professionals. Our role is to make sure the details in your objectives and goals are met through effective communication and coordination of your team.